What a cinematically sumptuous, delicious film. And gosh, it makes me want to be a dressmaking fool! It's another quirky outing by auteur Paul Thomas Anderson, and if it's to be Daniel Day-Lewis's final performance, well, it's one heckuva way to wrap-up a storied career. It's part Pygmalion, part romance, part psychodrama, part thriller. Aside from language, it's all innuendo and tension, and what a phenomenal job DDL does at drawing us into the simplest and most banal daily routines. I'll never quite look at eccentricity the same way again, nor breakfast. There are no words to describe how beautiful—how literally, physically beautiful the film's appearance is. It's a stunning wedding cake, flecks of powdered sugar glistening in the air. 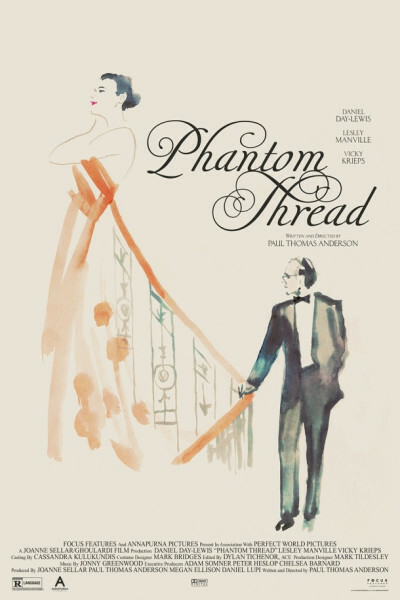 If you enjoy the slinky pursuits of cat and mouse, London in the 1950s, high fashion-house drama, and the unnerving, ominous, looming twang of tightly plucked cello and viola strings, Phantom Thread is summoning you posthaste to the top of the stairs.